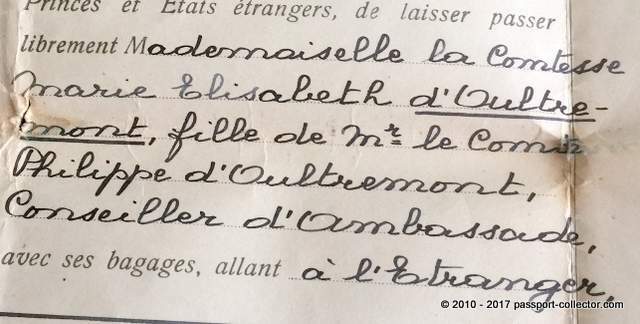 Marie was the daughter of Philippe d’Oultremont, a counselor to the ambassador as the document indicates. 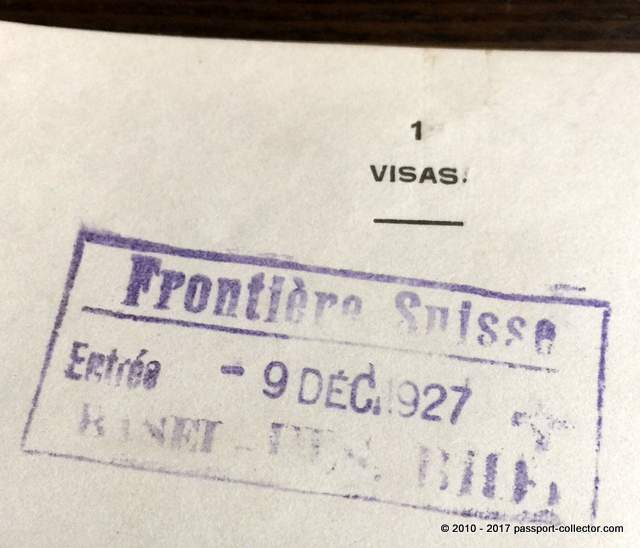 The passport has a 50 Fr revenue and a visa stamp of Switzerland. 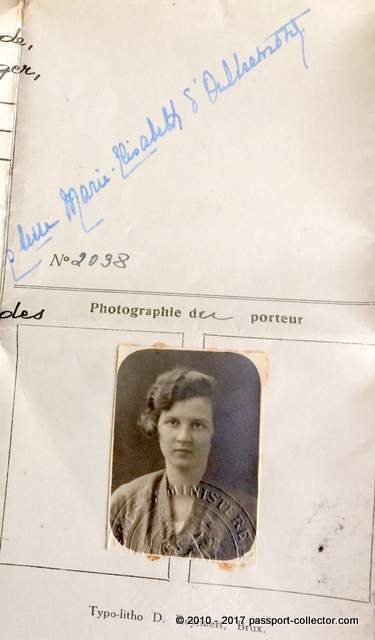 The condition is very good, including passport picture of Countess Marie Elisabeth.No entries on back. The Family d’Oultremont is an important and large Belgian noble family which goes back till 1330. The family received the title Count of the Holy Empire for all its members by a patent of Emperor Charles VI, 25th February 1731. 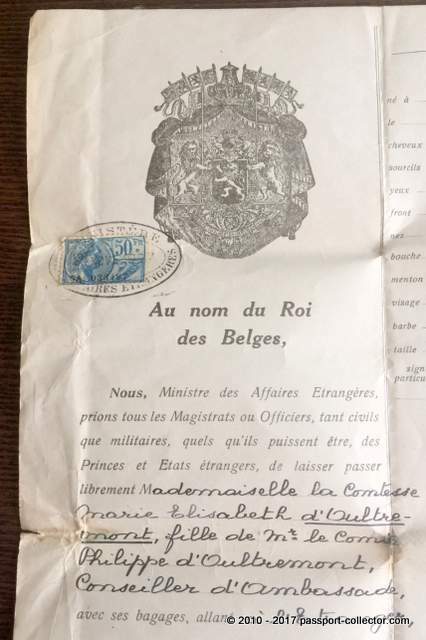 The family is well connected to the Belgian monarchy till today. Octave d’Oultremont was the Grand Master of the House of the Count of Flanders, Officer of the Order of Leopold, Grand Officer of the Legion of Honor, Great Cordon of the Order of the Red Eagle, Order of the Ernestine Branch of Saxony, order of the crown of Prussia and the order of St. Janvier, grand cross of the Dutch lion, burgomaster of Duras. 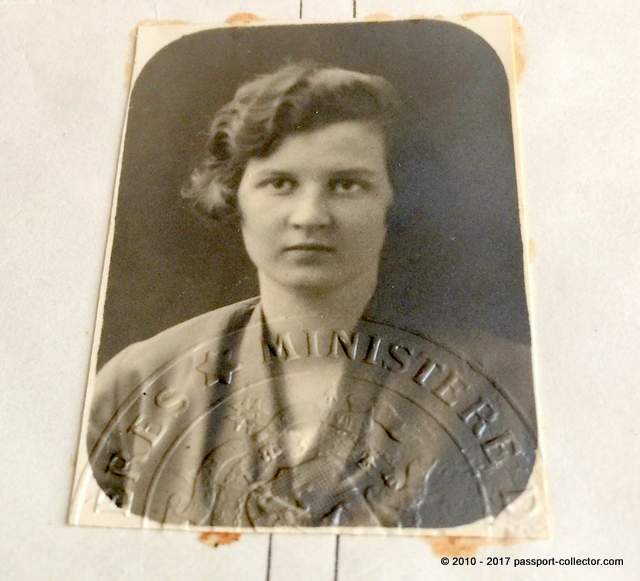 His mother was Joséphine-Louise Countess van der Noot of Duras, of the Duras branch, inherited by marriage from the castle of La Berliere. Adrien Oultremont (1843-1907) Lieutenant General of the Civil Guard, a cavalry officer, member of the House of Representatives of Belgium. In 1905 he was the co-founder of the International Aeronautical Federation with his friend Count Henry de La Vaulx, who later pronounced his eulogy. 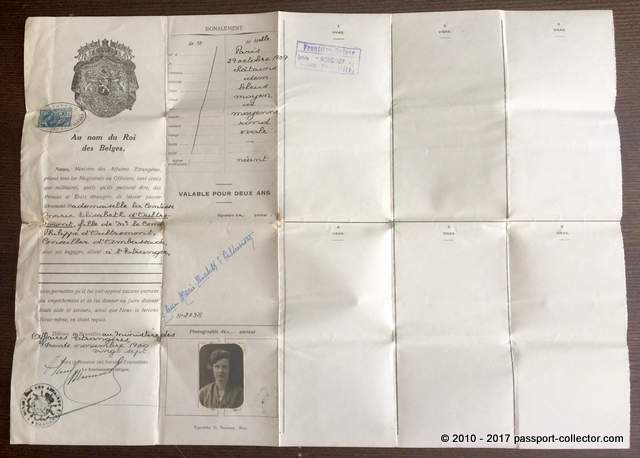 On May 27, 1907, Hadelin d’Oultremont took off with his balloonBelgium from the Parc de Saint-Cloud to Chartres, taking with him the Duke of Brissac to offer the baptism of the air to the future King Albert I of Belgium. Hermann d’Oultremont, rider, 1920 Olympic silver medal in horseback riding. He took part in numerous international Steeple-Chases which he won for several consecutive years between 1912 and 1930. War cross (Belgium) 1916 with fins 1922, Knight of the Order of the Crown (Belgium) with palms, cross of Fire , officer of the order of the Crown (Belgium) , military Cross (Belgium) first Class, officer of the order of Leopold , Commander of the order of Leopold II , order of the royal crown of Prussia, the officer ‘ order Of the Sword of Sweden , Major of Cavalry. 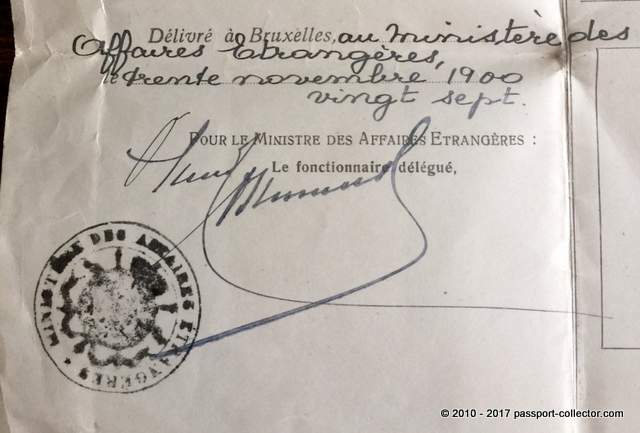 The Belgian Passport 1927 of Countess Marie Elisabeth d’Oultremont is undoubtedly an exciting travel document not only for passport collectors.